I cordial-ly invite you to embrace the spirit of today’s food holiday and raise a toast to October 16. It’s National Liqueur Day! It’s also World Food Day, a holiday celebrated around the world to celebrate the anniversary of the founding of the Food and Agriculture Administration on this date in 1945. More than 150 countries participate in order to raise awareness of poverty and hunger. Since 1981, it has adopted a different theme every year, used to highlight areas where action is needed, and to provide a common focus. Themes over the years have included Food Security (1983), Trees For Life (1991), and Youth Against Hunger (1999). This year’s theme is Sustainable Food Systems for Food Security and Nutrition. Eat My Words is doing its part by mentioning this important global movement, and encouraging you to learn more by visiting this website. Percolation: Alcohol gets passed directly through the flavoring agents in order to take on their essential flavor. There are four categories of liqueurs: generic liqueurs (such as triple sec); proprietary liqueurs, made from secret recipes by specific manufacturers (e.g. Peach Schnapps); cream liqueurs, homogenized with cream; and creme liqueurs, which are thick and syrupy. I have to admit, we weren’t real original tonight. 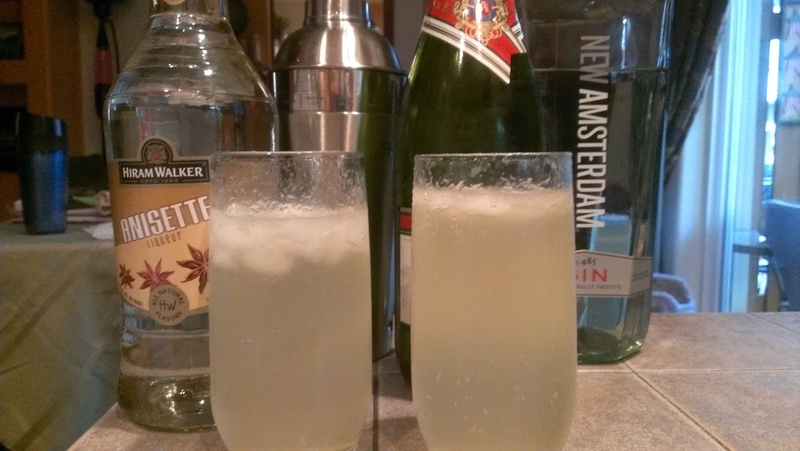 We made margaritas with Grand Marnier – an orange and cognac liqueur. Which is exactly how we celebrated National Grand Marnier Day earlier in the year. But we had plenty leftover, and we were making tacos anyway, so it made sense. They were just as tasty this time, too! You’ll want to hop on over to the fridge in order to take advantage of today’s food holiday. September 28 is National Drink Beer Day! It’s also National Strawberry Cream Pie Day, but with so many pie holidays already under our belts (plus the fact that I am away from home from before sunrise to after sunset today), we decided to celebrate beer. I should add that I despise beer, so this wasn’t a holiday I was particularly looking forward to. Tara, on the other hand, is a big Bud Light fan, meaning today was no big deal to her. There was already a National Drink Wine Day in February, so it’s only fair that beer gets a day devoted to drinking it, as well. Beer is one of the oldest-known beverages humans produced, and was probably discovered by accident after cereal grains containing sugar fermented on their own. Records of beer date back to at least 5000 B.C., and references to the alcoholic beverage have been found in ancient Egypt and Mesopotamia. The oldest known recipe is a 3900 year old Sumerian poem that pays homage to Ninkasi, the goddess of brewing. They really did have gods for everything back then! This beer was made with barley and bread. Beer became such a way of life – it was enjoyed on a daily basis by Egyptian pharaohs, was prescribed to treat illnesses, and was often given as a sacrifice to the gods – it has been argued that man could not have developed technologies and built civilizations without it. I guess after stacking blocks into a pyramid shape all day, nothing hits the spot like a tall, cool one. I had no idea beer was so highly revered by ancient peeps! Kinda makes me feel bad for not appreciating it more, but try as I might, I have never been able to stomach the stuff. I know it’s an acquired taste, but I’d rather spend my time acquiring liquor or wine. Still, when in Rome and all that jazz, so I made sure to snag a beer during today’s symposium. We happened to be at McMenamin’s Edgefield, which has an onsite distillery. 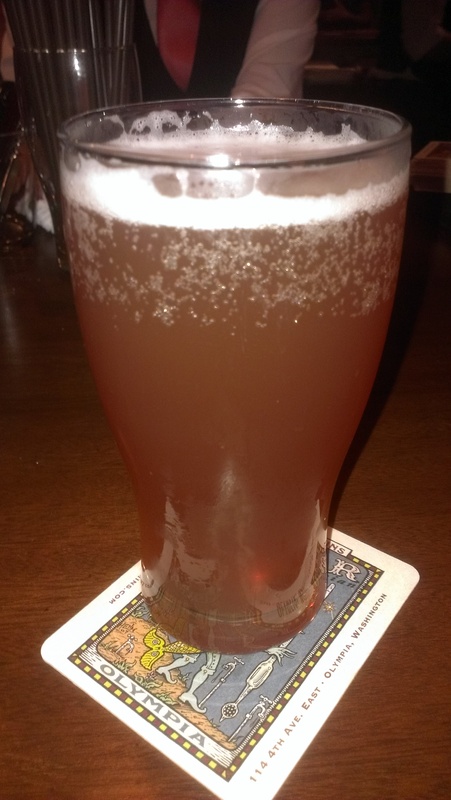 I asked the bartender, “What kind of beer would you recommend for somebody who doesn’t like beer?” He suggested a “Ruby,” so I took him up on his suggestion. As far as beers go, not exactly terrible, I’m still not a fan. I drank a little over half, though. Tara celebrated at home with, of course, Bud Light. Avast, ye scurvy dog! I might just make you walk the plank if ye don’t be participatin’ in today’s food holiday. September 20 is National Rum Punch Day! I think it’s great how bartenders long ago came up with clever little poems to describe their drinks. They were a talented lot back then, that’s for sure! 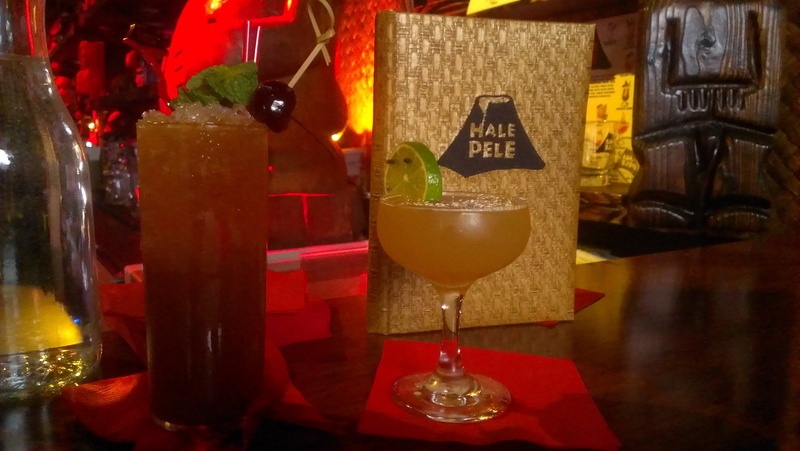 In honor of National Rum Punch Day, Tara and I decided to hit up our favorite Portland tiki bar, Hale Pele. 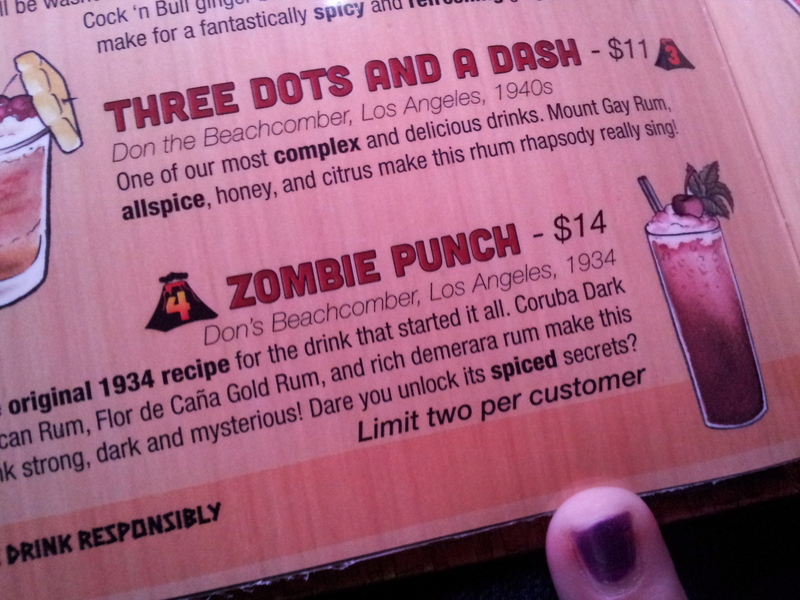 After all, they’re known for their rum concoctions. All I can say is: holy cow, these packed a wallop! If you like your foods in mint condition, today’s your day. September 15 is National Crème de Menthe Day! It’s also National Linguini Day and National Double Cheeseburger Day. We might have been inclined to celebrate double cheeseburgers today, but National Cheeseburger Day is coming up on Wednesday, and that would be some serious beef overkill. 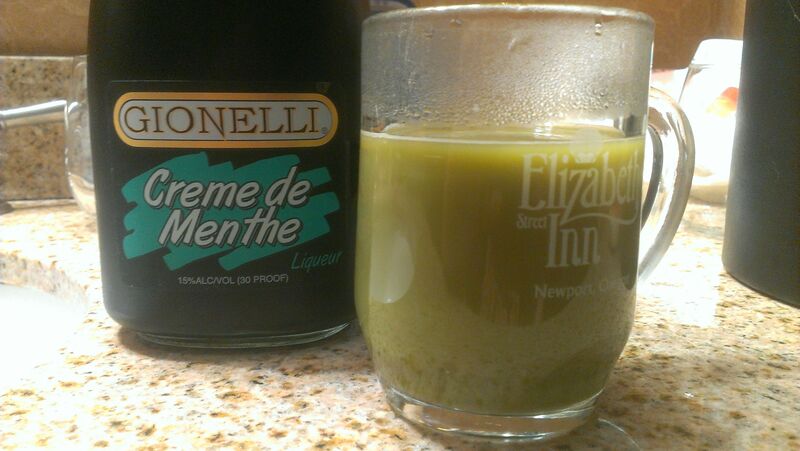 Since we’re staying at the Oregon coast one more night and already have a special dinner planned that does not involve linguini, we decided the easiest holiday to tackle was Crème de Menthe. The crème de menthe figures prominently in many works of literature. Kurt Vonnegut, D.H. Lawrence, Agatha Christie, and Ian Fleming all wrote books in which main characters favored the drink. (But never Bond…James Bond. He always stuck with his martini – shaken, not stirred). To celebrate this holiday, we purchased a bottle of crème de menthe and brought it along with us. We weren’t really sure what to do with it, and after all the drinking we partook in over our wedding weekend, we weren’t exactly dying to “tie one on” again. I ended up brewing a cup of coffee and adding a shot of creme de menthe. It looked disgusting – it resembled avocado-colored coffee – but actually, didn’t taste too bad. We were pleasantly surprised! If you like your cocktails on the tart side, today’s going to be right up your alley. August 25 is National Whiskey Sour Day! 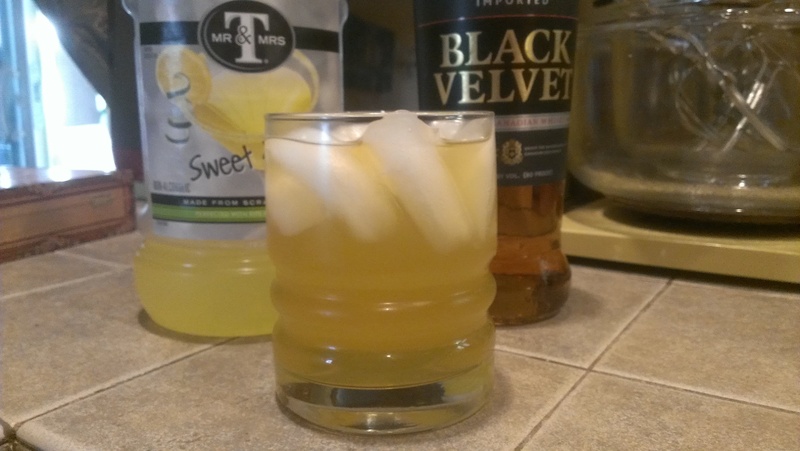 The whiskey sour is considered a “retro” cocktail. This simply means it was popular a long time ago, fell out of favor, and is now making a splash all over again. A splash that includes whiskey, lemon juice, and sugar, the basic ingredients for a whiskey sour (though you could cheat and use commercial sour mix instead). Bourbon is often substituted for whiskey, though really, they are the same thing: bourbon is simply a type of whiskey. To help explain the difference, the Jim Beam website says, All bourbon is whiskey but not all whiskey is bourbon. Tennessee whiskey? Not bourbon. Canadian whiskey? Nope. Scotch? Definitely not bourbon… you get the idea. Are you as confused as I am now? I’m not even going to attempt to decipher scotch. Adding sour ingredients to cocktails began in the 1700s, when British sailors added lime juice to rum in order to prevent scurvy on those long ocean voyages. And in order to preserve the fresh juice, a little bit of rum – or gin, or whiskey – was added to the juice, as well. One can only imagine the spirited breakfast conversations that ensued after downing a glass of “juice.” Soon, these sailors discovered that the addition of a little bit of sugar made it all taste better. The oldest reference to a whiskey sour dates to a Wisconsin newspaper article published in 1870. A Peruvian newspaper called El Comercio de Iquique published a story in 1962 claiming that Elliot Stubb, an English steward aboard a ship named Sunshine, created the whiskey sour in 1872, though historian Oreste Plath had originally attributed the Pisco Sour to Stubb, apparently in error. Either way, the whiskey sour has long been a favorite of mine. 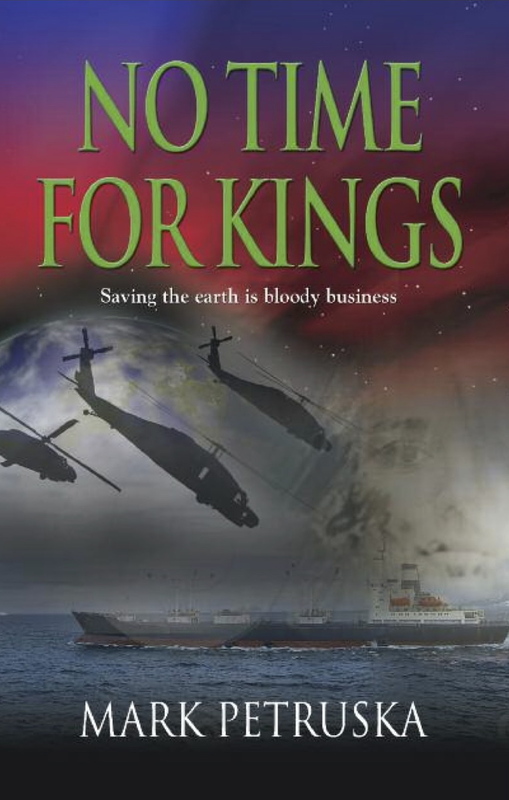 In fact, the villain in my novel No Time For Kings is described as having a fondness for whiskey sours, and the drink appears in a key scene in Chapter 15. Yes, that’s a shameless plug. It would be more shameless if I mentioned the Kindle version (just follow the link if interested) is priced at a very reasonable $2.99. Ahem. Back to the food blog. Fun fact about whiskey: it can remain bottled for 100 years, and will still be good when opened. Once it is opened, it’ll remain drinkable for about 5 years. So if you were to buy a bottle today, you could conceivably still drink it on August 25, 2118. But boy, would you be old. To celebrate, I whipped us up a whiskey sour. Or two. Hey, you gotta do what you gotta do, right? Hopefully you won’t try to worm your way out of celebrating today’s holiday. In fact, you should embrace the spirit! July 24 is National Tequila Day. Chances are, if you think of tequila, margaritas come to mind. Or a catchy song by The Champs. You know the one…it’s got real challenging lyrics. Tequila is made from the blue agave plant, primarily found in and around the Mexican state of Jalisco. Aztecs used to make a fermented beverage from the agave plant called pulque, when they weren’t busy building pyramids and sacrificing humans. Spanish conquistadors arrived in 1521 and, when their brandy ran out, turned to the blue agave plant themselves, creating North America’s first distilled beverage. Originally called mezcal wine, it went through several name changes – mezcal brandy, agave wine, and Juan – before finally being called tequila after the nearby town of the same name, which means “the place of harvesting plants.” The first licensed manufacturer was a gentleman by the name of José Antonio Cuervo, who was granted a parcel of land from the King of Spain in 1758. Tequila didn’t really take off until after 1821, when Mexico gained independence. During the Mexican Revolution, tequila became a symbol of national pride and patriotism. During Prohibition it was smuggled across the border into the U.S., helping to solidify its popularity here; during WWII, European liquor was hard to come by, and tequila’s popularity rose to ever higher levels. Mexico passed regulations in 1944 stipulating that in order to be called tequila, blue agave must be distilled in the state of Jalisco. As for the worm in the bottle? It’s nothing more than a marketing ploy dreamed up by Americans in the 1940s in an effort to boost sales; they created a myth the worm in the bottom of a tequila bottle contained magical and aphrodisiac properties, and gringos everywhere should consume it as a rite of passage. True tequila never actually contained a worm, though it is sometimes found in bottles of mezcal, which differs from tequila in that it may be distilled from plants other than blue agave. Technically it’s not even a worm, but the larvae of a moth that feeds on the maguey plant used to distill some varieties of mezcal. Bet you feel like a real sucker now if you’ve ever eaten a “worm” from a tequila bottle! 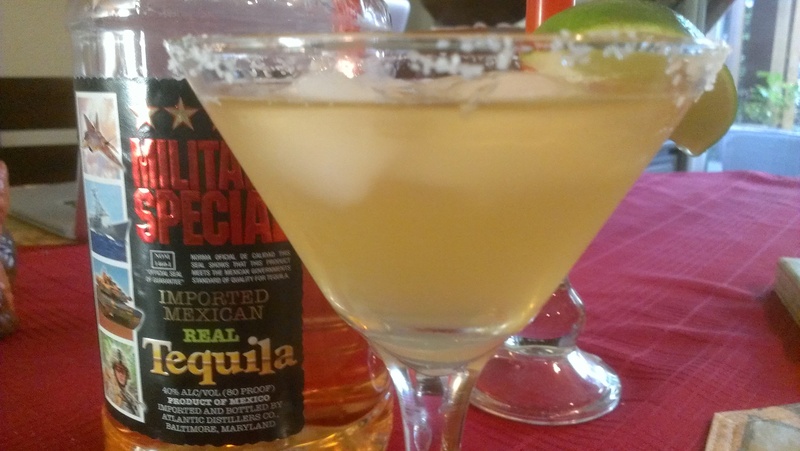 Obviously, tequila is strongly associated with the margarita; even though we recently celebrated this holiday, it gave us a good excuse to whip up another batch of margaritas, which are one of my favorite alcoholic beverages. You’ll notice the fine quality imported tequila we used to honor today’s holiday. Jose Cuervo, eat your heart out. Don’t rum away if you’re a fan of classic cocktails: July 19 is National Daiquiri Day! It’s also the 200th day of the year, which means our food challenge continues to roll right along. 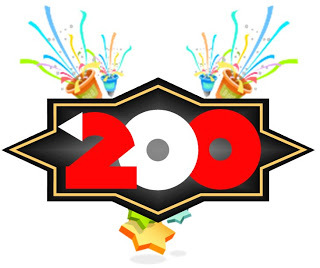 Reaching our 200th challenge feels like a momentous occasion, much the way that # 100 did. We’re more than halfway there and loving every minute of this! And this weekend is tricky, since we’re going camping. Tent camping, too – no wussy cabins and stoves for us. Luckily, our food challenges over the next couple of days lend themselves well to the Great Outdoors. Daiquiris are considered one of the “6 basic drinks” listed in David Embury’s The Fine Art of Mixing Drinks. They consist of rum, lime, and sugar, and may be served blended (frozen) or on the rocks. In 1898, Teddy Roosevelt’s Rough Riders stormed the town of Daiquiri, Cuba during the Spanish-American War. The military’s greatest coup from this invasion turned out to be a cocktail recipe named for the town: it was given to the Army and Navy Club, and soon became a popular drink with U.S. soldiers thanks in large part to wartime rationing of whiskey, vodka, and other spirits in the 1940s. 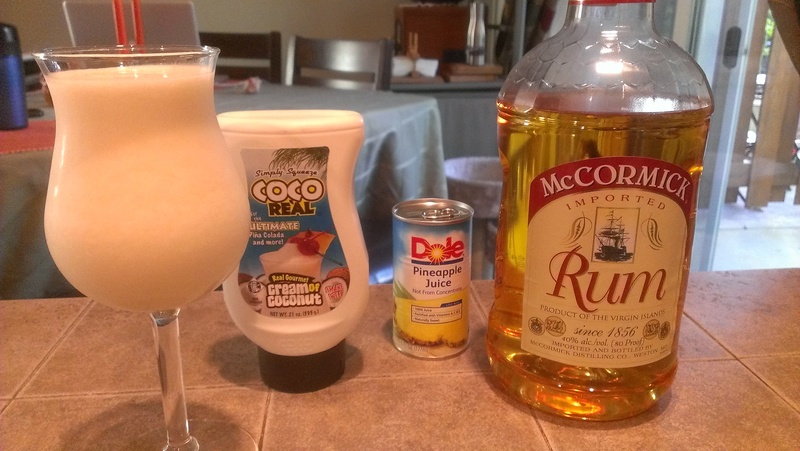 No such ban on rum existed, so our brave boys made do with daiquiris. The cocktail was also a favorite of writer Ernest Hemingway, who – let’s face it – never met an alcoholic beverage he didn’t care for. In his novel Islands In The Stream he wrote, That is what we are. No one in between. How could we be wrong? Sail away with me to another world, where we’ll rely on each other, uh-huh. Oops…wrong Islands In The Stream. My bad. What HEMINGWAY wrote was, It reminded him of the sea. The frappeed part of the drink was like the wake of a ship and the clear part was the way the water looked when the bow cut it when you were in shallow water over marl bottom. That was almost the exact color. How poetic! 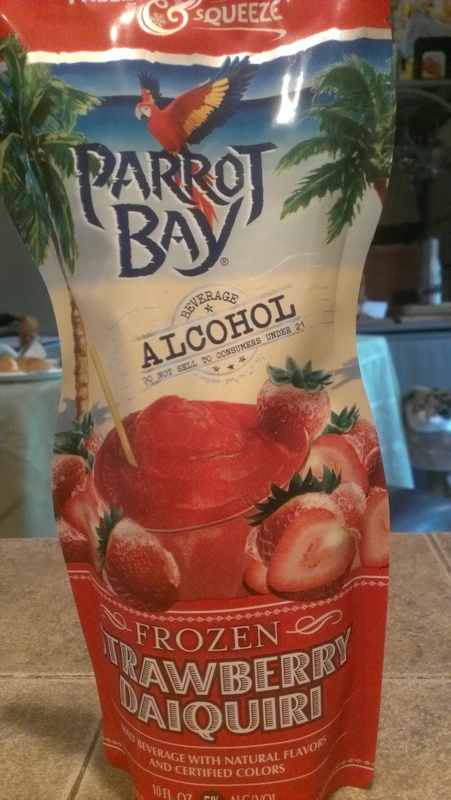 Ernest even came up with his own version, dubbed the Hemingway Daiquiri. What the name lacked in originality it made up for in rum: Hemingway’s drink had double the alcohol and none of the sugar. The author once downed 16 of these in one sitting. The drink was also a fave of John F. Kennedy, which means it was also probably a fave of Marilyn Monroe and the mob, right? Frozen daiquiris made with a variety of flavors became popular over the years thanks to their convenience and versatility, but I’m thinking those Mafiosos prefer the good ol’-fashioned shaken and pulverized version, if you know what I mean. Orange you glad we get to raise our glasses to toast another alcoholic beverage today? July 14 is National Grand Marnier Day! Grand Marnier is an orange-flavored liqueur invented in 1880 by Alexandre Marnier-Lapostolle. It’s made with cognac brandy, bitter orange essence, and sugar. In other words, it’s high-end stuff (and also explains why I usually just substitute generic triple sec in cocktail recipes calling for Grand Marnier – but there’s no cheating allowed today). Grand Marnier is a popular ingredient in a large variety of drinks including the Cosmopolitan, Margarita, Sidecar, Dirty Harry, Grand Mimosa, B-52,The Bloody Smash, The Maced Marnier, The Ace Marnier Smash, Frosty Smash, The Smace, The Grand Hound, The Blood Pug, The Clarke, The Nogley and the Grand Marnier Fireball. I don’t know about you, but I’m dying to walk into a bar and order a Blood Pug someday, just for the hell of it! The original name of the drink was Curaçao Marnier after the Caribbean island where the oranges used in the liqueur were grown, but a friend of Alexandre’s said the name “wasn’t grand enough.” Hence, Grand Marnier! Since I don’t have a lot of background info to discuss, I thought I’d take a moment to give you a glimpse into some of the behind-the-scenes action here at Eat My Words. For instance, did you know these posts are usually written ahead of time? Sometimes days and days ahead of time, as a matter of fact. At one point we had ten posts all ready to go. I’ll research the food history, come up with a few funny asides, and save it as a draft, filling in the blanks – I rarely know the specifics of what we are eating or drinking until the actual day, and of course I can’t take a picture of the actual food until it’s right there in front of us (all photos are mine, and are of the actual food or beverage we are about to consume) – when I’m ready to post. It didn’t start out this way, but since the majority of challenges are completed in the evening, I quickly learned that it was a lot of work after an otherwise long day to research and write these posts, so having it done ahead of time would be advantageous. The same was true with weekends. We’re usually on the go and busy doing other things, so having posts written in advance allows us to maximize our enjoyment of that time off. Only recently have I been writing even further ahead. Case in point: as I’m typing these words, it’s actually Tuesday morning, not Sunday evening. Shh. Most of the time the process is seamless and nobody is the wiser, but sometimes plans change and I forget to make corrections to the already-written post. For instance, a couple of weeks ago we had planned to be in Seattle, so I had written that we were there. Then we decided to delay our trip, but I forgot to delete one line in which I said we were “busy with family obligations in Seattle.” Which, of course, Tara’s mom caught. Oops. The lesson to be learned is: edit, edit, edit! 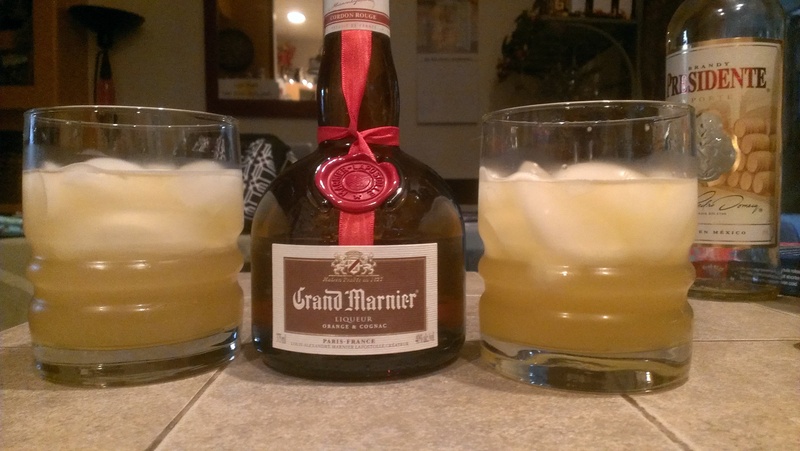 When we got home, we enjoyed Grand Marnier two ways. We took a shot straight up, and it was smooth and tasty. 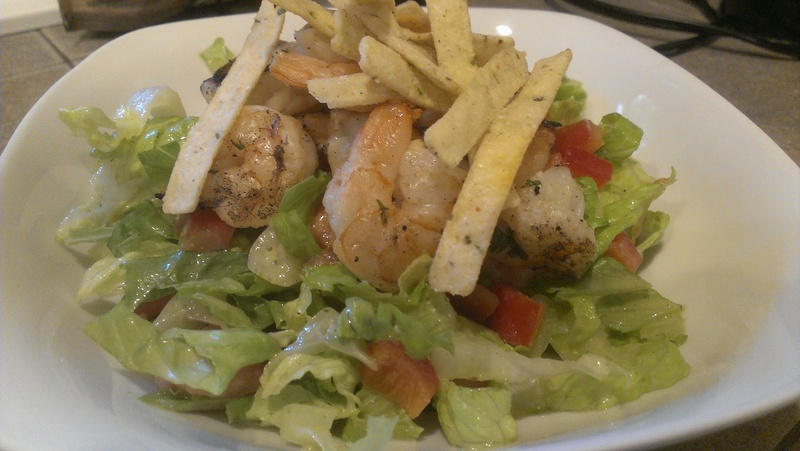 We wanted to jazz things up a bit and do something unique with this ingredient as well, since we’ve admittedly been coasting by lately, so Tara found a recipe for shrimp marinated in a mixture of tequila, lime juice, Grand Marnier, cilantro, and cumin and served on a bed of romaine with crispy tortilla strips. We grilled those to go alongside steaks, and ended up with a second great way to enjoy this most excellent beverage! 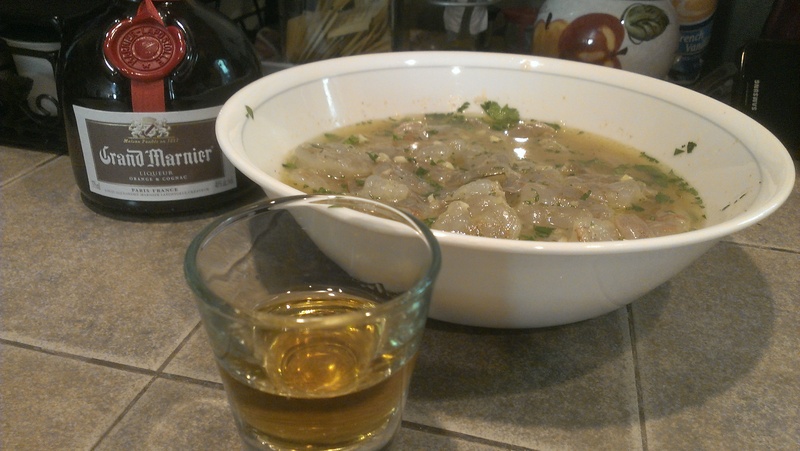 Grand Marnier two ways: in a shot glass, and as part of a marinade for grilled shrimp. There’s Grand Marnier in there, too! If you subscribe to the phrase candy is dandy but liquor is quicker, you’ll be racing at top speed to celebrate today’s holiday. July 2 is National Anisette Day! 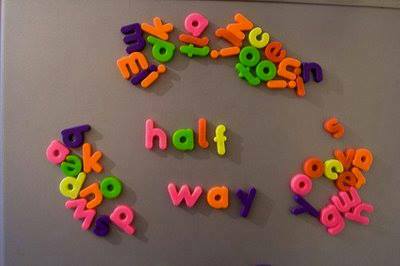 Today also marks the halfway point of our food challenge! Hard to believe we’ve successfully conquered six months’ worth of challenges. On the one hand we want to celebrate because we’re halfway to the finish line! On the other hand…we still have half a year to go. Yikes. But we’re making good progress! If you’re wondering what exactly anisette is…so were we. It’s a potent anise-flavored liqueur popular in the Mediterranean, particularly in Spain, Italy, Portugal, and France. It may taste like licorice (blech), but contains no actual licorice, unlike other anise-flavored liqueurs. It’s sweeter than most, and has such a high alcohol content it can burn your throat if you drink it too fast. I’m not going to lie: reading that scared the bejesus out of me! Marie Brizard, a well-known French alcoholic beverage company, began producing anisette in 1755, the year they were founded. Anisette is closely related to absinthe, the notorious “green fairy” from Moulin Rouge that was banned in the U.S. until 2007. Reading this did not ease my trepidation in the least. Anisette is most often mixed with a little bit of water which, when swirled in a glass, brings out the essential oils in the alcohol, turning the drink milky-white. If that ain’t a neat parlor trick, I don’t know what is! Shake all ingredients (except champagne) with ice and strain into a collins glass over ice cubes. Fill glass with chilled champagne, stir lightly, and serve. I have to say, I was fully prepared to hate this cocktail. First off, one whiff of the anisette was enough to turn my stomach – it reeked of black licorice. And the ingredients are a strange combination, to say the least. Champagne? Gin? Lime juice?? So I was very pleasantly surprised when I actually took a sip, and found it not nearly as bad as I’d expected. I daresay, I actually liked it. It was better than the dry martini, the orange blossom, and the mint julep, that’s for sure. Go figure. (Tara was not quite so enamored of the flavor, but at least she didn’t spit it out).